The Nativity franchise is a strange beast. Every film has received a critical panning. The highest rated in the series currently sits at 46% on Rotten Tomatoes, the lowest sits at 16%. But some how, this series always finds its audience and I believe that’s because the heart of this franchise is very much in the right place. 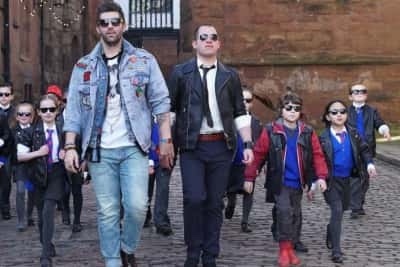 There’s a soft reboot in the mix here, as Marc Wootton has vacated his signature role as Mr Poppy and been replaced by Simon Lipkin, who plays his long-lost half-brother Jerry. Along the way, Jerry teams up with a stray dog and, a Syrian child named Doru. The pair teach neglectful parents to be less neglectful, all whilst staging the most ambitious musical that Coventry has ever seen. Lipkin absolutely nails his performance here, he fills every frame with madcap energy, giving his all, even when the film around him starts to drag. Craig Revel Horwood chews the scenery and is clearly having a lot of fun, as the pantomime villain. I’ve read some other reviews of this film, prior to writing my own and I can see every negative point they make. Yes, characters come and go randomly (I suspect filming schedules clashed). Yes, the climactic stage performance is a little too long, but it’s fun and genuinely pulls at the heart strings. I laughed, I cried, I smiled. I recommend Nativity Rocks!